Do you smell something fishy? No, of course you don’t! Don’t worry that bad smells will scare people away when you wear this hat. This 100% odorless fish will attract people to you instead! 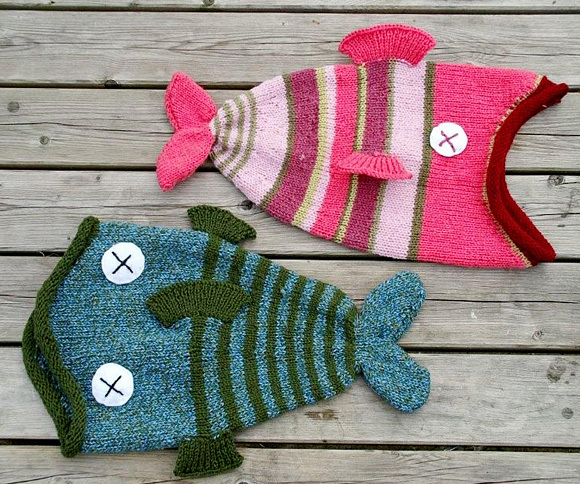 It was specially designed for a boy called Jonas, fish lover and future sea biologist. 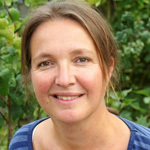 But it looks good on any other head, even if you are not 10 years old any more! This hat is an ideal project for using left over bits of yarn. Vary with colors and striping as much as you like! If you prefer, simply replace the X in the fish eye with a dot for a pupil and you can revive your fish hat, so to speak! Mouth is shaped using short rows. It is not necessary to pick up wraps when working wrapped sts on subsequent rows; edge of mouth will be hidden by rolled edge of lip. Row 1 [RS]: K27, W&T. Row 2 [WS]: P9, W&T. Row 3 [RS]: K10, W&T. Row 4 [WS]: P11, W&T. Row 5 [RS]: K12, W&T. Row 6 [WS]: P13, W&T. Row 7 [RS]: K14, W&T. Row 8 [WS]: P16, W&T. Row 9 [RS]: K18, W&T. Row 10 [WS]: P20, W&T. Row 11 [RS]: K22, W&T. Row 12 [WS]: P24, W&T. Row 13 [RS]: K26, W&T. Row 14 [WS]: P28, W&T. Row 15 [RS]: K30, W&T. Row 16 [WS]: P32, W&T. Row 17 [RS]: K65, W&T. Next Row [RS]: K to end of round. Continue as follows, changing colors as desired. Work 4.75 inches in stockinette st. Decrease Round 1: [K8, k2tog] 9 times. 81 sts. Work 2.5 inches in stockinette st. Decrease Round 2: [K7, k2tog] 9 times. 72 sts. Work 1.5 inches in stockinette st. Decrease Round 3: [K6, k2tog] 9 times. 63 sts. Decrease Round 4: [K5, k2tog] 9 times. 54 sts. Work 0.75 inch in stockinette st. Decrease Round 5: [K4, k2tog] 9 times. 45 sts. Decrease Round 6: [K2tog] to last 3 sts, k3tog. 22 sts. Next Round: K17; place last 11 sts worked on small st holder. First half of tail will be worked back and forth over remaining 11 sts on needles (last 5 sts of current round and first 6 sts of next round). If desired, work tail using straight needles. Replace held sts on needle and rejoin yarn with RS facing. Work Rows 1-21 as for first half of tail. Lay hat flat, so that longest parts of short-rowed fish mouth are at center, and shortest parts are at side folds. Mark a column of sts along center of hat; this will be top of fish. Beginning approx. 6 inches above lower edge of hat and working towards tail, pick up and k 15 sts in marked columns of sts, picking up 1 st for each row. Next Row: [Kfb] in each st to end. 30 sts. Work 10 rows in 1×1 Rib. 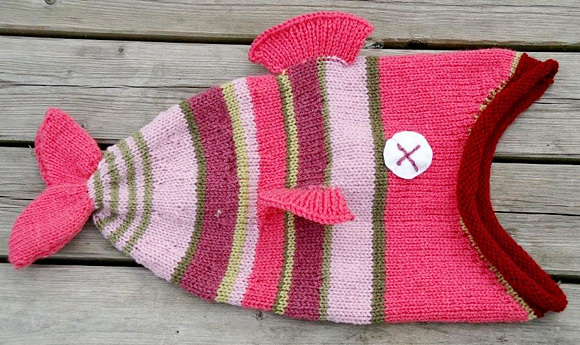 BO all sts knitwise. Mark a column of sts at each side of hat, centered over shortest parts of short-rowed fish mouth. Beginning approx. 6 inches above lower edge of hat and working towards tail, pick up and k 10 sts in one marked columns of sts, picking up 1 st for each row. Next Row: [Kfb] in each st to end. 20 sts. Continue as for Dorsal Fin. Repeat for other marked column. 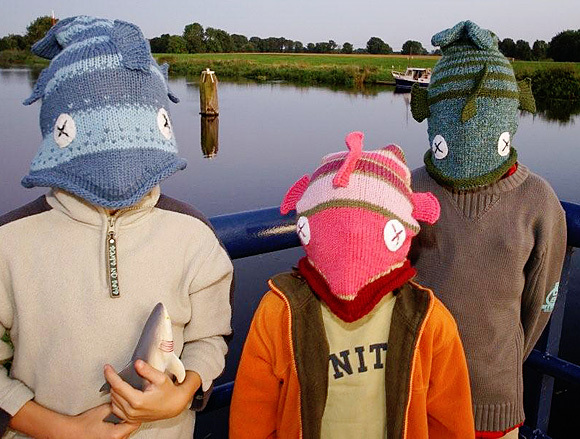 Thelma Egberts is a Dutch knitter who has a thing for weird and funny hats. She mostly uses leftover yarn and yarn from stash (even her grandmothers stash!). That’s why she often has to improvise on patterns or design her own. 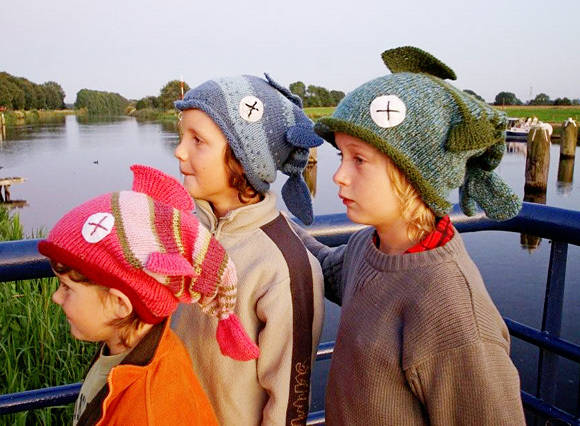 Luckily her son Jonas (future sea biologist) likes uncommon hats too. The Dead Fish Hat is his favorite. At first he even didn’t want to share the pattern. But eventually he did and now it’s on Knitty! This entry was posted in Đan, Đan áo cho bé trai, Đan cho bé gái, Đan cho bé trai, Đan cho trẻ em, Đan mũ cho bé gái, Đan mũ cho bé trai. Bookmark the permalink.